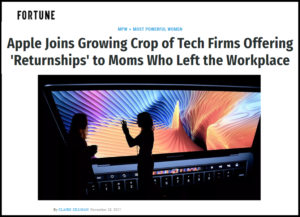 “A nonprofit aimed at getting women back into the workforce is expanding its network to include some of the biggest names in tech. Path Forward announced on Tuesday that 10 new companies will be joining its ‘returnship’ program next year, including Apple, Oracle, Intuit, and Udemy. In helping companies set up ‘returnship’ programs, Path Forward helps answer an acute need—from a company standpoint and from the individual participants’ points of view. Firms that have worked with Path Forward in the past say advertising ‘returnships’ broadens their talent pool by reaching candidates they may miss with traditional recruiting practices. And because the program targets caregivers—most of whom are women—it gives companies a direct line the female applicants in an era when many corporations, especially those in tech, are prioritizing gender diversity.